Are you looking for a healthy recipe that still tastes good? Good news! I think you’ve found one here. 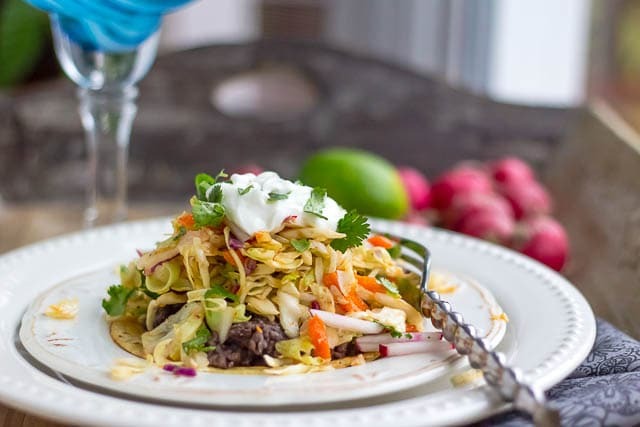 This tostada begins with a corn or flour tortilla that is topped with seasoned black beans, followed by a cabbage/vegetable mixture, and is topped with sour cream. This was sooo flavorful and easy to make (this alone makes it a winner in my book). Plus, anything with lime, chipolte, and cilantro is pretty much instantly added to my favorites list of recipes. These tostadas are a perfect way to throw together a quick dinner or lunch. I used pre-shredded cabbage, which came packaged as green cabbage, red cabbage, and carrots. Then, I julienned radishes and roughly chopped cilantro and added to the salad, which is then tossed in a lime-chili dressing and then topped with a lime-flavored sour cream. No a big fan of black beans? Substitute shredded chicken, or use both. Feeling naughty? You can also add a bit or a lot (!) 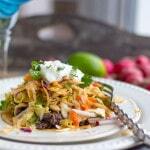 of shredded Mexican cheese on top on the bean layer and melt it under the broiler before adding the salad topping. You can also use flour tortillas in place of the corn tortillas and just warm them in lieu of crisping the corn tortillas in oil. This was so good that I’m going to have it again today. Heat 1 to 2 teaspoons oil in small non-stick skillet over medium heat. Add broth and smash the beans, stirring until saucy. In a large bowl, stir garlic, chili paste, 2 tablespoons lime juice, sugar and 1/2 teaspoon salt. Tostadas are so filling and healthy! I love the beans in them. Yummy! I agree! I love when food is both healthy and amazingly good.